1, the sofa is the living room center, is the living room facade, not only to consider the comfort, but also consider the face problem. 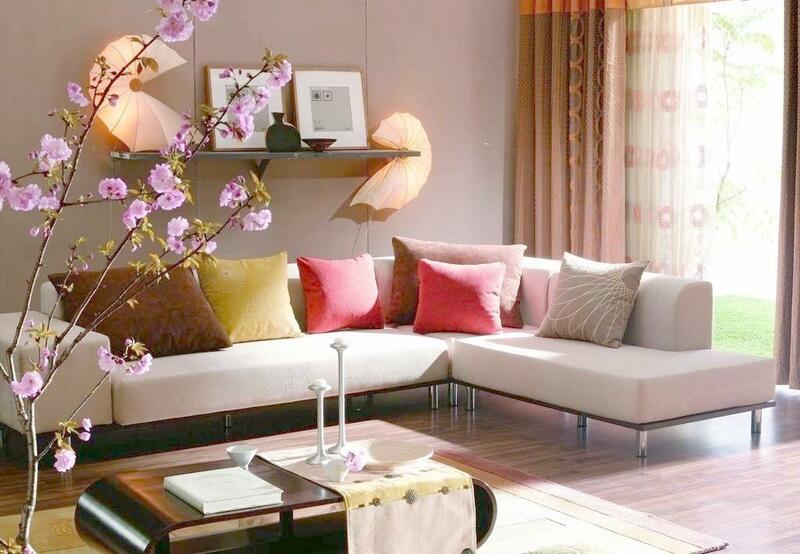 Sofa in the living room is a larger color body, a direct impact on the spatial color effects, it is recommended to choose cloth neutral color sofa to light-based, (pillow can freely choose the color). The living room curtain is a relatively large color body, the two colors on the unity of the best, if not uniform, you can add a carpet to expand the scope of the theme of color. Of course, if you like the sofa is so colorful, you can color the curtains and wallpaper colors together. In short the color of the living room theme lighter, too bright and easy to visual fatigue. Living room accessories can increase the number of colors, do not business atmosphere is too strong, after all, is the home. 2, sofa sets of choice, may also be more nerve-racking, love at first sight better, if it is because the price is right or like this style, but the store put the sofa sets do not like, need to look at cloth selection cloth cover, this time Should pay attention to, is a different set of cloth, sofa prices will fluctuate, the other is a small cloth plate, will cause some illusion, promising color, made of cloth after you will not imagine the same. This time the best and shopping guide to communicate well, look at is not a spot or a real picture, in advance to see the overall effect of cloth sets, so as not to send the sofa when the home and then regret it. Comfortable sofa, sitting on top to appreciate that the sofa cushion sponge directly affect the quality of the sitting. The mid-range furniture brand sofa, sponge in three layers, the first layer is more soft, sit more comfortable, the middle layer is slightly harder, play a buffer role, the last layer of the hardest, played a supporting role. Brand sofa will promise the life of the sponge, for example, N years, the sinking rate of sponge in less than the number of percent. It is best to open the cloth cover to see the color of the sponge, as well as smell what smell. According to a brand shopping guide said that the price of cloth sets accounted for one-third to two-thirds between the sofa, cloth sets of domestic and imported points, the price difference quite big. Fabric contact with the skin, just like buying clothes, like a lot of women than I am more professional, not to speak here, and we have the experience to buy clothes. Sofa in addition to the cushion, in the cushion below, is the sofa frame, then the cushion is below, embedded in the framework of the inside part of the brand is to choose the form of cloth as a buffer, but also some brands of springs, Each with advantages and disadvantages, if the quality of the spring will appear bad noise, of course, the quality of good or bad, or have the brand protection. Cushion is very important, cushion is also very important, there are sponges filler, but also down, or look at the specific fabric sofa which standard. There is a pillow, in addition to the well-known role, there is a pad at the waist, or by the head, the role of flexibility, and also can choose a more lively color, increase the vitality of the sofa. 1 sofa environmental protection may be a lot of people ignore, in fact, should pay more attention. Fabric sofa choose more solid wood frame, wrapped in cloth cover, it will not paint treatment, etc., so basically environmentally friendly. Sofa on the majority of the general sponge, but also more intimate contact with the human body, then the sponge are environmentally friendly? Of course not, so when choosing the sofa must ask the sponge, is not a smell. 2 pillow and pillow If you are using feathers or feather filling, then also note that the bad business may use some unqualified things as a filler. Therefore, when the purchase, be sure to consult clearly, when necessary to open the pillow to take a look, smell the smell.